For a bride to be, hen parties are all about enjoying the remaining days of before going from single status to married. It is the time where you get to spend time with your friends to reminisce or talk about just about anything. But just because people call it a “hen party” it does not mean it has to be like any other wild and naughty hens’ party. It could be a serene and simple party where you and your friends could just sit or spend quality time together. Here are some ideas on how to have a hens’ party with class. Hens’ parties can just be all about the relaxing tub, invigorating treatments, sauna, quiet surroundings, fluffy robes, fruit juice shots and some relaxing time in the spa lounge. A spa weekend is a relaxing way to celebrate your last days of being single with your friends. You could book early in your nearest spa where you and your friends would enjoy and relax all by yourselves for a few hours. Or, if you have the funds, go to classier spa or book the whole spa so that you can have the whole place for yourselves. To celebrate the bride to be, a special treatment can be arranged just for her. Having a girls’ night out is another simple but classy hens’ party option. Sit around a table and just talk over drinks or food. If you have the budget to spend, you can book in a hotel. But if you don’t, you can do it in your own house but it might need a few preparations for the house. Free up some space and prepare some beds to accommodate your guests. A girls’ night out can be organized a movie night, enjoying your favorite chick flicks while sitting around on pillows while eating popcorn, chips, pizza, all paired with wine and just having a laugh. Or you could do it in your backyard or garden or just outside your house. Move out your TV, pillows, cushions and blankets and you could watch your movie there instead. Decorate your party with colorful decorations and accessories to keep your party alive. If you want your hen party to be more dynamic and active, you can go shopping and spend the whole day in the mall with your friends. Bring her to her favorite boutique and buy her a voucher so that she can shop something for herself. To make it more special, you can bring the bride to her favorite restaurant and arrange a little lunch or dinner party. While you’re there, you can arrange a surprise for the bride. It is simple but it may surely be a memorable hen party for the bride. Go away with your guests for the weekend to a private cottage or the beach to have your hen party. It is another relaxing way to have a private and simple hens’ party. Going to a private get away place or just somewhere away from the noisy urban streets would give you a tranquil place for you to have your hen party. Hen party planners recommend to have the venue to be exclusive or hidden. 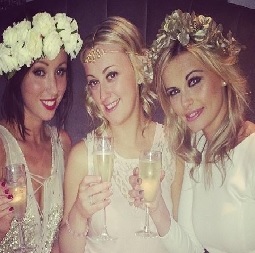 A hens’ party does not have to be lavish which would cost you to spend so much. Just having a simple drink with your friends at a bar would be a cozy way to spend your hens’ party. Reserve for a table at a bar and let your guests dress up for the occasion. Choose a piano or jazz bar or just an intimate cocktail bar to have your party. This can also be done in your home or if you have an accessible rooftop then it could be a perfect spot. These ideas are just some hens’ party options to have a simple yet classy party. But the most important is, however or wherever you spend your hens’ party, you get to enjoy and spend time with your friends for you may not have as much time with them when you already tie the knot. So, do away from the generic hens’ party and make it memorable for you.